Earlier this year, I blogged about my to-watch list of science fiction and fantasy films. Since then, I’ve been periodically reviewing certain films that I enjoyed and thought you all might like, too. Previous instalments in this series include Into the Forest, Annihilation, Coco, and Winchester. 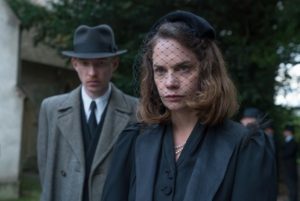 The Little Stranger is the 2018 film adaptation of a book by the same name written by Sarah Waters, one of my favourite authors. This story was set in 1948, and it followed about a year in the life of Dr. Faraday, a middle-aged man who was one of only two doctors in his rural community. He grew up in a low-income family at a time when the vast majority of children did not move into higher social classes as adults than the ones they were born into, so he was still adjusting to the changes that higher education had brought to his life when this mystery began. 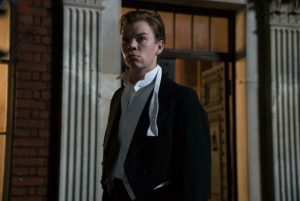 In one of the earliest scenes in the plot, Faraday revisited Hundreds Hall, a mansion that his mother once worked in, after one of the servants who worked at that estate came down with a mysterious illness. The last time he’d visited it had been nearly 30 years ago when he was a young boy and his mother brought him to a public celebration there after the end of World War I. Hundreds Hall was crumbling by 1948, and the family who lived in it had isolated themselves from the surrounding community to an alarming degree. It was nothing at all like the glamorous, well-kept home that Faraday recalled from his childhood, and the Ayers themselves didn’t seem to be doing well either. 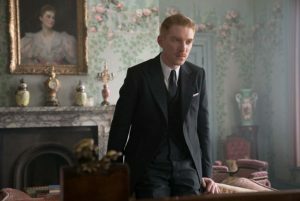 After a brief encounter with Roderick, Faraday asked to come back again to see if he can treat some of the pain and muscle stiffness that Roderick had been dealing with since he was wounded in the war. (I’ll give you more details about these characters in a moment). While he knew that the Ayers have lost much of their wealth over the past few decades, Faraday was still shocked by how much the property has deteriorated since he last saw it. Could their inability to pay for necessary repairs explain what is going on, or was there something else afoot in this once-stunning mansion? Dr. Faraday, the protagonist, was a middle-aged bachelor whose days are generally spent holding office hours at his clinic and doing home visits for patients who were too contagious, sick, or frail to come see him. Most of his patients were poor, so he didn’t make a great deal of money for someone in his position despite his prestigious title and the long hours he worked. Mrs. Ayers was the matriarch of the Ayers family. 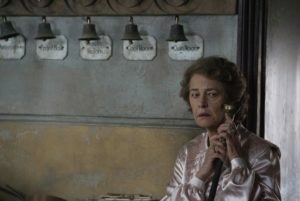 Her life had changed dramatically since Dr. Faraday first met her in 1919, from the births of Caroline and Roderick to the steep decline in her fortunes and social standing. She had once hosted grand parties in her home, but she now hid away from the community she’d once embraced. Even her own children didn’t seem to spend a great deal of time with her despite the fact that they all lived in the same home. Caroline Ayers was Mrs. Ayers daughter. She was by far the most intelligent and resourceful member of the Ayers family, and there were several intriguing references to the things she’d accomplished before her brother’s terrible injuries happened in the war. Roderick was Mrs. Ayers son. He was badly injured during World War II. When the events of this book began, he was still dealing with both the physical and psychological effects of his wartime experiences in a time when mental health issues were not well understood and when doctors had far fewer treatments for the serious burns and other injuries he’d survived. One of the things I’ve always loved about Sarah Waters’ writing style is how adept she is at giving evidence that can support multiple interpretations of a scene or plot. Most of her books don’t have the strong mystery elements in them that this one does, so the fact that she was able to pull this off while writing in a genre I haven’t seen her spend much time in before was impressive. Dr. Faraday was a character I had mixed feelings about from the beginning. In one of the earliest scenes, the audience saw him visiting Hundreds Hall in its heyday and purposefully breaking off an ornamental acorns from one of the walls in this home. The reasons why he did that were explored later in the storyline, but they didn’t give me a good first impression of this character. Getting to know him as the adult he was a few decades later softened my opinion of him. As I mentioned earlier, he’d grown up in a time and place where it was nearly impossible to escape the social class one was born into. The fact that his family had scrounged up enough money to get him through medical school was amazing, and I did admire the determination and grit he must have needed to get through such an experience when his family had so little money to spare. As intrigued as I was about the Ayers, I didn’t feel like I got to know them quite as well as I could have. I appreciated the fact that Faraday was given so much time to shine, but I would have liked to know a few more details about who Roderick, Caroline, and Mrs. Ayers were as individuals before they began experiencing so much misfortune. The little pieces of their pasts that were shared were well done. I simply needed a few extra scenes describing how and when things had gone so terribly wrong for them. With that being said, this was something I also noticed in the novel. Explaining why these characters weren’t quite as open with Faraday or the audience as I would have preferred them to be would be wandering dangerously close to spoiler territory, and I do understand why they were written that way even though I wish they could have been a little more forthcoming in the film. What I did love about the storyline was the way it encouraged the audience to ask questions. It wasn’t immediately clear what was really going on at Hundreds Hall. The servant that Faraday was called to treat was quite spooked by living in there, but she refused to tell him who or what had frightened her. This pattern of dancing around the question of whether what was happening in this mansion was supernatural in origin or had a purely rational explanation occurred over and over again. Just like when I read the book, I formed my opinion about what was going on pretty early on. I won’t tell you what it was, but I will say that I really enjoyed the process of weighing the evidence and coming up with the most likely explanation for all of the strange, and sometimes violent, occurrences at Hundreds Hall before the final scene was revealed. This is something I’d strongly recommend checking out to anyone who likes any of the themes or genres I mentioned in this review. I liked this adaptation and thought it complemented the original story nicely. Speaking of Violence, Is It Gory? I definitely wouldn’t call this a gory film, but there were a few scenes in it that involved a little blood. If anyone would like more information about this, know that I’ll have to share some mild spoilers in order to go into detail about it. For what it’s worth, I wasn’t bothered by these scenes even though I strongly dislike gore in general. They were brief and fit the tone of the storyline well. 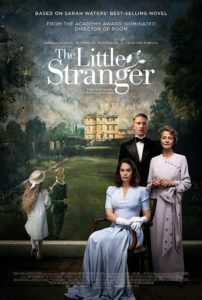 The Little Stranger is available on iTunes.